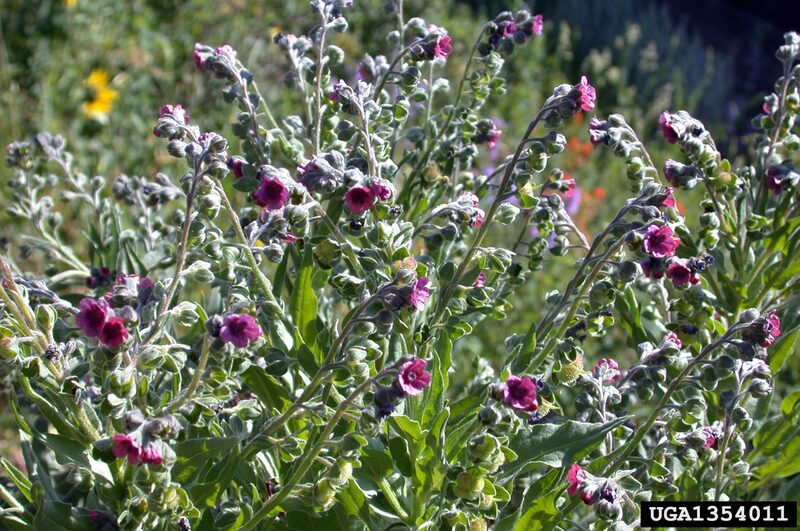 General Description: Houndstongue is a biennial or short-lived perennial that grows 1 to 4 feet tall. The taproot is thick, woody, black and branching. All parts are covered with hairs. Flower Description: Flower clusters in upper leaf axils and at stem ends. Flowers are a dull reddish-purple to burgundy and 3/8 inch wide. They have 5 lobes. Leaf Description: Leaves are alternate, hairy, rough and lacking teeth or lobes. Lower leaves are narrow, 4 to 12 inches long and about 1 to 2 inches wide and have petioles (leaf stalks). Upper leaves are similar and without petioles (attach directly to the stem). Stem Description: Stems are upright and branching at the ends. They are hairy and coarse. Fruit/Seed Description: Flowers form 4 nutlets, with each nutlet containing one seed. Nutlet surface is covered with barbed hooks that allow itself to be attached to animals and people for dispersal. It is a very strong competitor of desirable forage and is poisonous. It contains pyrrolizidine alkaloids that stop the reproduction of liver cells. Sheep are less susceptible than cattle or horses. It can also cause dermatitis in humans.